Who says coming to Hua Hin is just to lie lazily on one of the beautiful beaches to enjoy the calmness and stunning scenery? Pala-U Waterfall is a great surprise for those who never think that you will be able to enjoy the genuine beauty of both the sea and the forest here in Hua Hin. Recommended for all, although the trekking up the waterfall is not recommened for small children, elderly or those with heart problems. Visitors who have at least few days in Hua Hin shouldn’t and wouldn’t want to miss Pala-U Waterfall, one of the most beautiful waterfalls not only in Hua Hin District but also in Prachuab Khirikhan Province. Located in Kaeng Krachan National Park which is the largest National Park of Thailand, Pala-U gained popularity and fully became the famous tourist place in 1995. Only sixty-three kilometers from the city on the highway number 3129, you will enjoy the journey as much as the destination. Big and small trees along the roadsides and the distant scene of green mountains with the clear blue sky behind them will not fail to fascinate you. According to the record of the Tourist Service Centre of Pala-U Waterfall the number of visitors of Pala-U in each year is close to 100,000 people. This does not include those who come from various organizations which otherwise would raise the number to much larger. Though the 400 baht entrance fee for foreigners is rather high, the charming nature inside this forest makes it worth the cost. Pala-U is deniably one of the best places for “Eco-tourism” where you can touch a feeling of true nature in true forest. What all can you find here? The beautiful waterfall amidst the humid rain forest, the cool and refreshing air even in a hot sunny day, and the plants and animals communities silently making their living in the natural surrounding. Various kinds of birds and butterflies can also be observed especially in the early morning. Here is truly the right place where you can closely experience the real natural atmosphere. Pala-U is a large evergreen forest with the beautiful fifteen levels waterfall that shares the same name as the forest, Pala-U Waterfall. Here is the perfect place for tourists who love trekking adventure in natural atmosphere since the trail you are going to walk along the side of the waterfall is nothing but the real forest with the complexed stone tiers. You will need to walk through the narrow path with hanging lianas and surrounded by all kinds of plants. 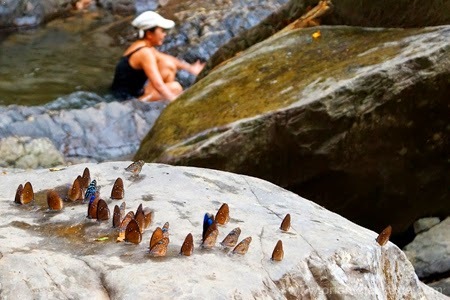 Small creatures can be found throughout the trail while colorful butterflies might give you company along the walk. 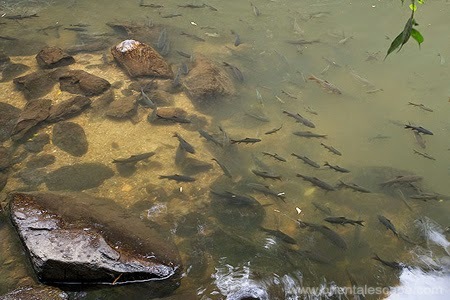 In the clear water there live uncountable Pluang fish (Soro brook carp) which the visitors can feed them with bread or the food that is available for sale. The path becomes increasingly harder as you keep on walking but that only proves it to be more exciting. far as the 6th level should be enough since the path beyond that is rather dangerous. To get to Pala-U Waterfall is easy. You can take local transport from the city for a distance of 63 kilometers. But if you can go on your own vehicle, it will be even more enjoyable since you will be able to stop on the way at various scenic spots to admire the gift of nature. However, it is a good idea to pack your food and also carry bottles of water with you because there is only one food shop available there and the shop is not open everyday but only on weekends and holidays. But the area that you can all sit and enjoy your food is not beyond the bridge before entering the trail to the higher level of Pala-U waterfall. Walking along the trail you will need to be careful as the stones at some spots will be slippery. Choosing the right kind of shoes might help to an extent. Remember that if you are planing on walking through the forest along the side of the waterfall you will find it benefited to be in the comfortable dress. Would you like to stay over? It’s not a bad idea to stay over at such scenic place since you can pitch a tent for shelter yourself in the allowed areas after paying the fee of thirty bath per person. There is also a suitable choice for those who prefer a comfortable staying since eight houses for rent are available which will cost only 1,200 baht per night (three people can stay). The houses are fully furnished and well decorated that you will not miss your comfy hotel in the city. Walk straight to the Tourist Service Centre for an advice to have your enjoyable stay amidst the beautiful nature. Pala-U Waterfall is actually visited throughout the year. However, during the rainy season is the time Pala-U sees the least number of visitors. November to April or May is the time you can see the huge number of tourists visiting this charming place. Furthermore, at Songkran or New Year the place turns really crowded that the Tourist Service Centre will have to double the number of the staffs who take care of the tourists especially in the waterfall area. However, winter may be the best time to visit Pala-U waterfall as the perfect weather condition can be observed during this time.